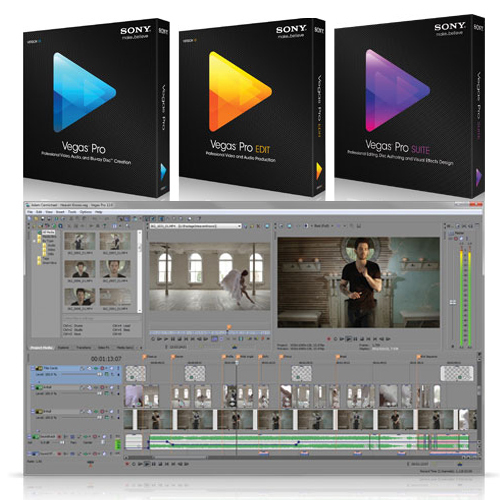 The Vegas™ Pro 12 Suite is a full-featured production environment for video editing and compositing, multi-track mixing, sound design, visual effects, and disc authoring. Direct project integration between Vegas Pro and HitFilm lets you move media between the programs without rendering or "flattening" the images. 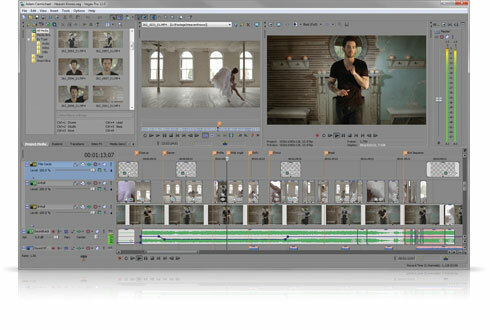 Use HitFilm to add a range of dramatic and realistic special effects like smoke, fire, explosions, lightning, and more. Master your audio in Sound Forge™ Pro, automate your editing workflow with Production Assistant, and add the perfect musical background with 100 royalty-free soundtracks. These powerful tools, combined with the high-end performance and ground-breaking innovations in Vegas Pro 12, means it’s never been easier to bring your creative vision to life. Edit SD, HD, 2K and 4K material in 2D or stereoscopic 3D, with drag-and-drop functionality or traditional 3-point and 4-point editing modes. The Vegas Pro 12 interface provides an impressive array innovative tools and thoughtful touches, with a fully customizable workspace for accomplishing a wide range of production tasks. The new Expanded Edit Mode temporarily splits the track at the edit point and enables you to dynamically add or remove frames from either side of the edit point while the media is playing, creating a highly precise, interactive editing experience. 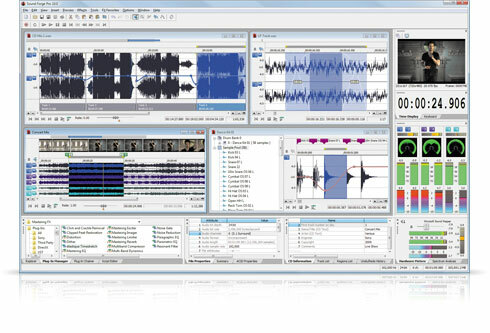 In addition to being a very powerful NLE, Vegas Pro is a high-performance multitrack audio recording and mixing application. For precise processing and mastering of audio material, send your audio clips directly from the Vegas Pro timeline to Sound Forge Pro. Fix common audio problems such as tape hiss, camera hum, clicks, and pops using the updated 64-bit Noise Reduction 2 plug-in collection. Use the élastique timestretch and pitch shift DirectX® plug-in to adjust clip duration without affecting pitch, or adjusting pitch without affecting duration.